Podere Lucignano Secondo is set In the very heart of the charming Tuscan countryside, among the smooth hills of Sienese Chianti and the fragrance of its green vineyards. It's a mansion built in 1898, now elegantly restored and turned into an exclusive relais. The Podere Lucignano Secondo Agriturismo, ideal place for lovers of relax and nature as well as food-and-wine connoisseurs, provides its guests with a warm welcome and an exclusive service. Podere Lucignano Secondo, is located in Gaiole in Chianti, in the heart of the striking Tuscany's countryside, among the sweets Chianti's hills and the fragrances of its green vineyards. 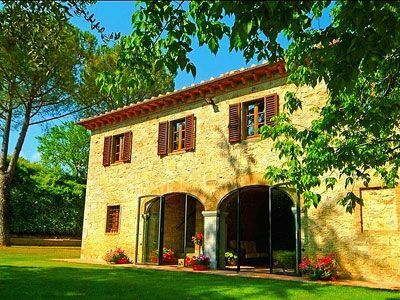 The farm holidays Podere Lucignano Secondo is the ideal destination for the lovers of relax, nature and wine and gastronomy. In Pianella there are shops, a restaurant, a post office, a bank and a petrol station. Nearby it's possible to make excursions in the Chianti area, do trekking or cycling, visit museums and art cities. High Season: 19/Apr-03/May; 24/May-27/Sep; 20/Dec-31/Dec.